A public project opens access for early detection and treatment of colon cancer to increase survival rates in underprivileged communities. Many people are unaware that colorectal cancer is the most common cancer affecting Malaysian men, and the third most common affecting women, with the highest incidence amongst the Chinese community. While the precise cause of colon cancer is yet unknown, it is possible to detect the disease early, increasing a patient’s chance of a successful recovery. Despite this, risk awareness and proactive screening for early detection remains a challenge. In launching the project, director-general of the National Population and Family Development Board, Datuk Aminah Abdul Rahman, on behalf of the Ministry of Women, Family and Community Development ,said, “Outreach projects like these are critical for the wellbeing of the community. It opens access for all segments of Malaysians to education, information, and total disease support ... Such access was never available before to this community. I applaud the widespread collaboration across the various medical, welfare, and community-led organisations in decreasing the health risks of our society.” “Screening projects to detect colon cancer in its early stage in Australia and UK have resulted in a reduction in colon cancer deaths and this is what we hope to achieve with this project. We are targeting to reach the poorer and less informed members of our society within the Sentul community. “We have worked very closely with the Sentul community in the development of this project to ensure that our outreach methods are both socially and culturally acceptable to the residents of this community. The local flat leaders are also very much involved in the implementation of the project as this provides the residents with the comfort of engaging with a familiar face, apart from the many volunteers we have,” said Dr Ng. 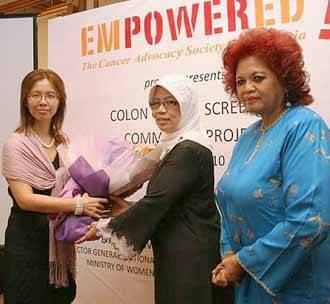 (From left) Dr Christina Ng, president and founder of EMPOWERED, director-general of the National Population and Family Development Board, Datuk Aminah Abdul Rahman, and Datin Paduka Khatijah Sulieman, vice president of the National Council of Welfare and Social Development, at the launch of the colon cancer screening project. Residents aged 50 years and above. Those with a family history of colon cancer. Registration booths will be set up and conducted at the respective eight flats. The registered patients will subsequently be given information about the date and venue of the screening programme workshop. Facilitated in three languages (Bahasa Malaysia, Mandarin, and Tamil), the workshop will educate the participants about the importance of healthy living, eating well and colon cancer screening. They will be instructed on how to use the faecal test kit that will be distributed during the workshop. Used test kits will then be collected by flat leaders, and handed over to Hope Worldwide Free Clinic to be sent for processing at Sunway Medical Centre. Counselors will individually contact and arrange for personal counseling sessions for patients who have abnormal test results. This will be done in their respective homes. The counselors will be appropriated accordingly to the patients’ relevant language group (i.e. English, Bahasa Malaysia, Mandarin, and Tamil). These patients will then be channeled for a follow-up colonoscopy at appointed screening hospitals. Patients will be given medical management based on the colonoscopic findings at the respective screening hospitals. For patients confirmed with cancer, a second meeting will be set-up by the counselors to discuss options moving forward for medical and financial support. The project will also provide total disease support to all its participants, which is especially important to the patients with positive blood on FIT as well as those diagnosed with cancer. A mechanism is in place to provide counselling support when needed. “Financial support is a significant factor we need to take into consideration, especially for the underprivileged community we are reaching out to. Hence, we are working closely with the Social Welfare Department of Malaysia to provide welfare assistance to patients who need to take time out of work to seek further testing and treatment,” said, Datin Paduka Khatijah Sulieman, vice president of the National Council of Welfare and Social Development (MAKPEM), a supporting party of the campaign.